Below you will find a relative minor chart that shows the relative minor for all of the major scales. But first let’s take a look at what a relative minor is. Don’t worry, this isn’t going to be as complicated as the diagram on the right here makes it look! A relative minor is a scale that is in the same key signature as the major scale. So, for every major scale, there is a minor scale that uses the same notes – it’s just that the scale starts on a different note. But the 2 scales have a very different feel to each other. How to Find the Relative Minor? The relative minor of a major scale starts on the 6th note of that major scale. So, to make this clearer, let’s use the C major scale as an example. In the C major scale, the 6th note of the scale is an A. The relative minor of C Major is therefore A minor. The C major scale is C, D, E, F, G, A, B – so with C being the 1st note. A is the 6th note. If you’re not sure how to construct major or minor scales check out the links below. This will make it a lot easier to understand if you learn those first. There’s another way (in addition to using the chart below of course!) to find the relative minor, and that’s using the circle of 5ths. If you’re not familiar with the circle of 5ths, check out the link below. For example, locate the C on the circle of 5ths. Now go 3 steps clockwise. You will get to an A. That A is your relative minor – so A minor is the relative minor of C major. Start with the major and go 3 steps clockwise on the circle of 5ths and you will find the relative minor that you need. 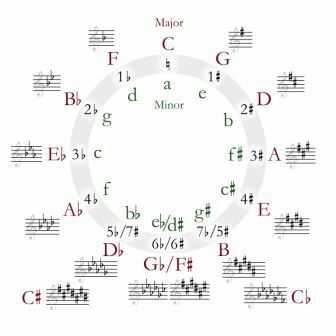 And, of course, the other way you can find the relative minor for any major is using the chart below. This is just using sharps (and not bringing flats into the equation) just to make it easier to look at but you could also get more technical and look at this in terms of key signatures but I’m not going to do that here, for sake of simplicity. I will be writing another post that talks about key signatures and will cover more of that side of things in there. I hope this has taught you something about relative minors and that the relative minor chart will be handy for you to use to find out the relative minor when you need it.